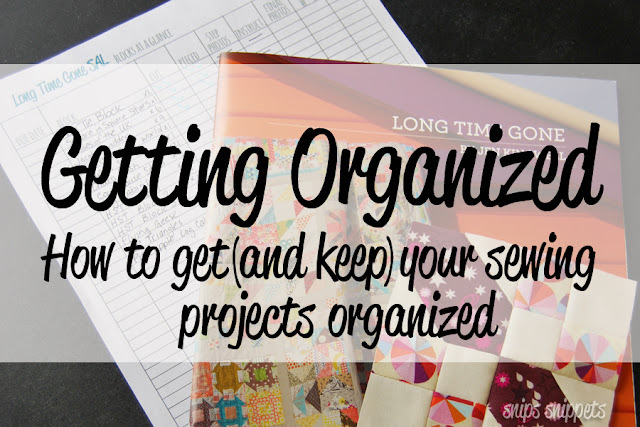 snips snippets: LONG TIME GONE SAL - keeping yourself organized! One week friends!! We only have one week to go and then it's on like Donkey Kong!! Are you all ready? There still time to join Angie, Marti and I on this most exciting (slightly crazy) adventure! Today I'm just popping in really quick to share some tips and tricks I use for staying on track and keeping organized while sewing. 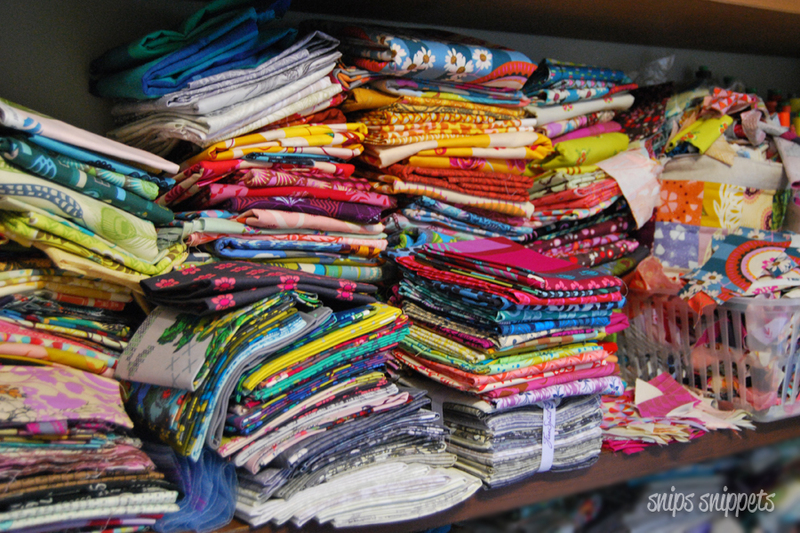 Nothing worse than getting halfway through a project and realizing you've lost the fabrics you've been using, or used them in another project or even put the blocks you've already made in a "safe location" so they wouldn't get lost. I have LOTS of "safe places" in my house. I'll be perfectly honest and say that I'm not the most organized person in the world. My sewing room is 99% of the time in complete disarray and I spend more time looking for things than actually using them. That being said I'm slowly trying my best to sort out my sewing space and reconfigure it in a way that best suits me. But we'll save that post for another day, today I just want to share some tricks that I use to make sure I have all my projects under control. My first tip is to really just find a system that works for you and stick with it across the board. For me it's a series of small things that I do that helps keep me on track. Starting with a chart. Angie actually introduced me to her clipboard method and I've found that it has helped in a huge way. Here's a better peek at my chart. Sorry for the faint text on the printout! I was actually thinking though that I might rework the chart to better suit all of you. Thoughts? Would anyone else be interested in a chart to help keep track of their blocks? I also use a similar chart for keeping track of all my sewing projects. 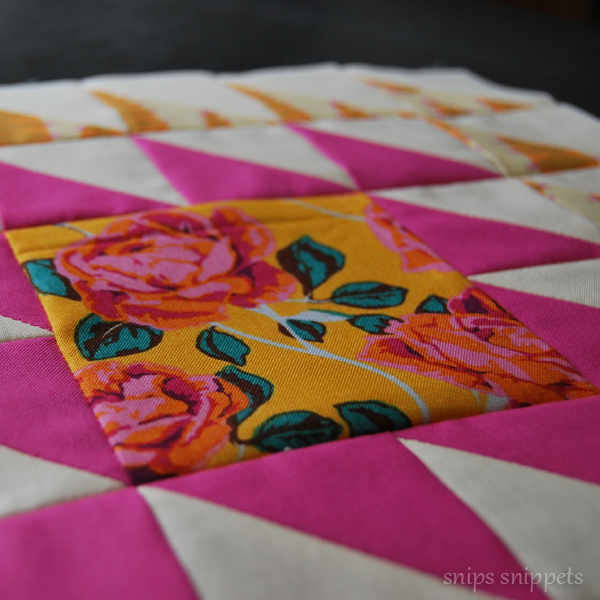 At any given time I usually have at least two quilts on the go for Love Patchwork and Quilting Mag along with numerous other sewing projects. So to have somewhere to easily look and see what still needs to be done makes my life that much easier. And come on, how satisfying is it to check off little boxes! For keeping track of projects in a more in depth manner I use the Evernote app. I've been using it for a few years now and love that I can use it both on my laptop as well as my phone and you can easily sync the two. I won't go into all the in depth details of the app but it's been a huge help in keeping me on top of things. They have a free version that is fantastic, I used it for quite a while before upgrading to the Plus version. They also have a Premium version, but for what I'm using it for the Plus version has been more than enough. It has way more features than I could ever list but what I love most is that I have access to my projects when I'm out. If I need to tweak an idea while waiting at school pick up I can. Or if there's an email I'd like to keep with a certain project I can forward it to my Evernote app and file it in the right place. I keep track of all my invoicing for LPQ there, along with all my contracted projects for them. All the details for a super duper top secret project are there and even a perpetual list of Christmas presents! Here's a screenshot of the version I use on my laptop. You can have multiple folders with multiple projects in each. Depending on the project sometimes I'll keep just basic info in the file, things like due dates and sizes, while others I have all kinds of notes, photos, sketches, fabric ideas, variations of patterns, I could go on forever. It truly has been a fantastic app for me. And that right there is it. Me. It works for me. You may not like it, you may have an app that works better for you and what you need it for. The trick is to just find something that works for you! So those are my two key systems I use for keeping track of my projects. Now, how do I keep track of everything in it's physical form? It's simple really. Here are some of my favourite ways to keep it all together! First, baskets. Nothing fancy, I bought all my baskets at a dollar store and they have worked for years! When I start a project I like to keep all the fabrics for that project contained in a basket. I won't use the fabrics in the basket for anything but the project it is for. So for this project, my 100days blocks, I refuse to use any of the fabrics until my blocks are done. That way I don't have to worry about not having enough, or forgetting to put fabrics back after using them for something else. Nothing worse than loosing the fabric you need to finish a project! It was also to help me finish things in a more timely fashion, so I could use the remaining fabric for other projects. This has not been the case for this project. Someday I'll finish my 100 blocks! Because of the small size of the blocks in this project I also keep the blocks in there too. Helps to keep it all together. For the Long Time Gone SAL though the basket just isn't big enough to hold the fabrics I'm using. Yep. Not going to fit in a basket. So All my AMH fabric that I'm working with stays on it's shelf and I just pick and choose what I want as I need it. Sometimes I'll pull for a couple of blocks and then put that fabric into a basket. Just to keep things tidy. But most days it looks like this. So when the baskets are not in use, or my blocks are to big to fit in the baskets I like to use my design wall as a block storage facility. I can't show you a shot of it right now because it's covered in all kinds of secret sewing, but it's really just a simple set up. Two flannel backed table cloths from the dollar store stapled to the wall. Cheep, easy and effective! But what if you don't have the wall space for a design wall? Or you have no room on said design wall to put blocks up. This is my problem, I never have any less than three quilts on the go and for the most part my design wall is home to all of them! Yep, stick them all in a pants hanger and hang them on a hook! Keeps them together and off of the design wall! But what if the block isn't assembled yet and you need to go out, or to bed. Or in my case you need to wait for the dang sun to come out so you can take photos for the tutorial! Have a scrap piece of batting? Lay your block pieces out on it to keep them in the correct order. Then roll it up and tuck it away until you need it! I also use this batting trick when I'm playing around with fabric choices for blocks. Helps hold things in place while you try different fabric combos! It also helps to keep pieces in order when sewing together or traveling back and forth from the iron. I've lost count of the number of times I've sewn something together wrong because I rotated a piece or a piece was mistakenly pushed aside. And finally, the last way I keep track of my bits and pieces for a project is with simple zipper bags. Yep, totally ghetto! But it works! This is particularly handy for me as I work a great deal at my parents place. And this way I can just grab the bag with the project I need, throw it in my purse and away I go! In some cases I use the bags to hold pieces of a certain project, like the bag on the right has all the squares cut that I need to finish the flying geese I need for my Brilliant Nutbag quilt, which will someday be finished! And the bag on the left holds some scraps I put together to make Halloween pillows last October. I had all this left and though I should just keep it in the bag and maybe have the boys make Halloween pillows on summer break. So the bags like this just get tucked into a box of WIPs that is in constant rotation here in my sewing room! 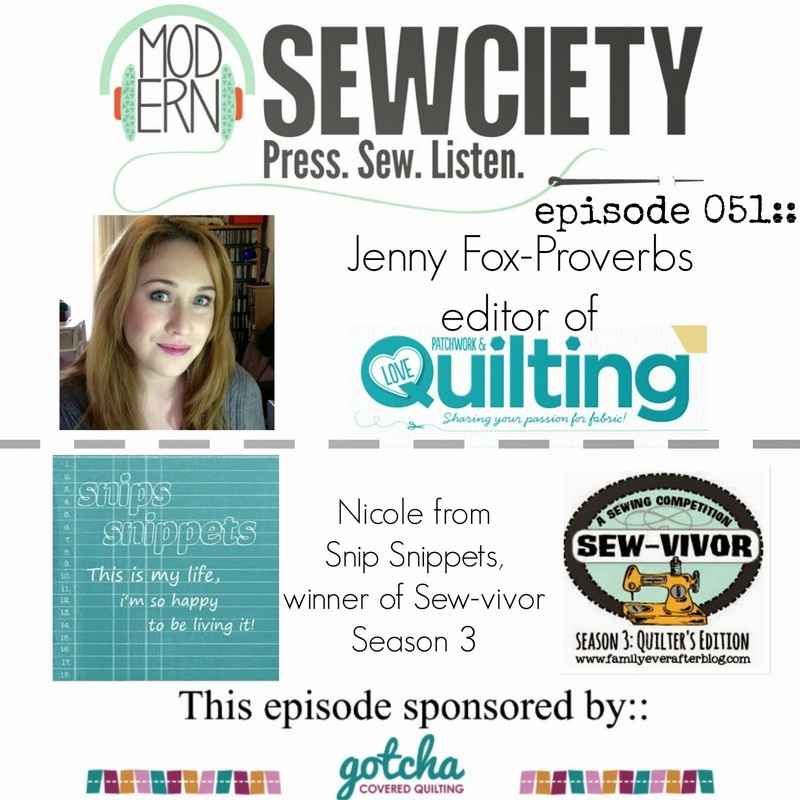 I hope you've all found a tip or two that will help you out on this sewing adventure that we're about to embark on, or maybe you have a tip or trick that you use to stay on top of your sewing projects. Please feel free to leave yours in the comments below! 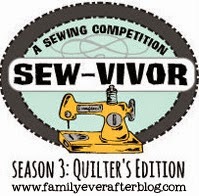 You should also pop over to Angie's blog too, she'll be posting her tried and true tips on staying on top of the sewing game! For those with questions please feel free to either email me or leave one in the comments, I do my best to answer just as fast as I can, but you know how it is! Life over here is with little boys, who always have something on the go! So please be patient!! Feel free to check out the FAQs section Angie has put up on her blog by clicking here, it may just answer that question for you! You can also see all the info on our wonderful sponsors and prizes offered, as well as how to win said prizes by clicking here! One week friends! We start in one week!! High fives for everyone today! Fabulous post and so many great tips (and eye candy!!!!). The app you use looks amazing for organizing and i love the batting trick!!! 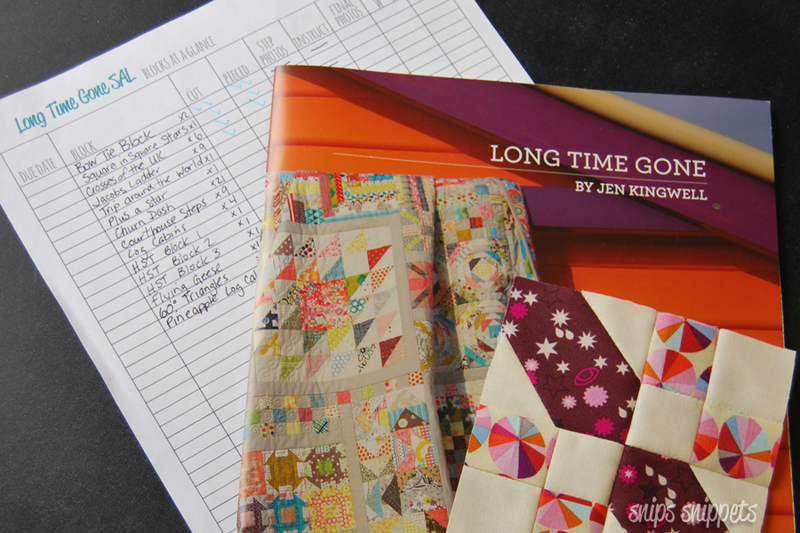 I am really looking forward to seeing your Long Time Gone quilt grow!!!!! I like to keep the cut pieces for individual blocks in sandwich bags- I stick a piece of washi tape on the bag and write the name or number of the block- I can then either peel off the washi tape or add another strip on top when the block is done and start the process over again. Love the idea of using the washi tape! I've been writing directly on the bag and then crossing it out when i reuse the bag! Your way is way more tidy and pretty too! a chart would be very helpful for keeping track. might you make it available to Longtime Gone QALERS?? I am curious about the clipboard comment (Angie actually introduced me to her clipboard method and I've found that it has helped in a huge way.) do you keep the blocks on the clipboard as well??? Please share more on the clipboard method.. I think I get the clipboard method now thanks so much for the response. Great tips! I am late to the Long Time Gone SAL party, but am grateful you still have your tutorials and tips posted!! Thank you so much!